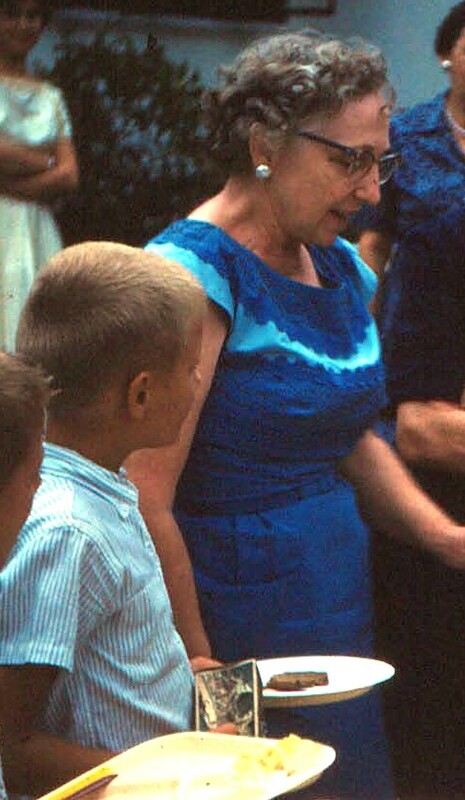 Mary Jane Harris Stratton at a Harris family reunion, 2002. Courtesy of Grier Harris. Courtesy of Grier Harris, The Harris Depot Project. Mary Jane Harris, third child of William Edney Harris, and his second wife, Minnie Ada Cope Harris, was born 8/24/1900, near Harrisburg, Cabarrus County, N. C., and was baptized by The Rev. R. J. Hunter, Pastor of rocky river and Harrisburg Presbyterian churches. She was his first child to baptize. Her parents moved to Harrisburg in the Fall of 1911, and soon afterwards she joined the Harrisburg Presbyterian Church. Her membership was transferred from this church to the Second Presbyterian Church, Charlotte, N. C. in January 1941. While holding membership in these churches she was active in various phases of church work and in 1966 was elected to serve on the Board of Stewards of the First Methodist Church. She attended the public school at Harrisburg, and Mont Amoena Seminary, a Lutheran Junior College, at Mt. Pleasant, N. C., from which she was graduated in May 1917. She taught school two winters in Cabarrus County, 1917-1918, at Shinn School, and 1918-1919 at Harrisburg School. She then took a business course in Charlotte at King’s Business College, and after completion of this course, did office work until her marriage. She became a member of Liberty Hall Chapter Daughters of the American Revolution, with National number of 342,318. Mary Jane Harris and George Frederick Stratton, of Charlotte, N. C., were married on May 2, 1931. He is the son of Louis Franklin and Georgia Anna Swinsie Stratton, and was 34 years of age, having been born 4/16/1897, at Kershaw, S. C., in Lancaster County. they were married at 9:00 A. M. at the First Methodist Church, charlotte, N. C., by the Pastor, Dr. V. V. Peele. About twenty-five friends and relatives were present. The Charlotte Observer (Charlotte, North Carolina), Wednesday, June 14, 2000. Mary Harris Stratton of Charlotte, NC, died Monday, June 12, 2000 at Presbyterian Hospital after a brief illness. She was born August 24, 1900 in Harrisburg, NC, the daughter of the late William Edney Harris and Minnie Cope Harris. Her husband, George F. Stratton preceded her in death in 1971. Mrs. Stratton graduated in May 1917 from Mont Amoena Seminary in Mt. Pleasant, NC and later from King’s Business College in Charlotte. She taught school for several years following which she pursued a business career and retired at age 94 from Armature Winding Company, a company started in Charlotte during 1907 by her husband’s father and which is still owned and operated by her children. She had been a member of the Liberty Hall Chapter of the Daughters of the American Revolution for more than 50 years. She had been a member of First United Methodist Church in Charlotte since January 1941 and was very active in various areas of church work, including service as a member of the Board of Stewards. One of her proudest achievements was by being recognized with a life membership by the United Methodist Women. Perhaps her major area of service with First United Methodist Church was as a member of the Parsonage Committee and the History and Records Committee for many years. She is survived by a daughter, Virginia S. Woolard and her husband, William L. Woolard; a son, George F. Stratton, Jr. and his wife, Margaret F. Woolard; four grandchildren, William L. Woolard, Jr., Margaret Anne Woolard, Kathryn S. Grindstaff and her husband, J. Steven Grindstaff and Robert F. Stratton; three great grandchildren, Nathan A. Woolard, Daniel A. Woolard and Matthew S. Grindstaff; and three sisters, Josie H. Woody, Margaret H. Quay and Kathryn H. Blume. Funeral services will be conducted at 1:00 PM, Thursday, June 15, 2000 at First United Methodist Church by The Reverend Dr. Ivan M. Peden and The Reverend Jessie C. Keaton. Interment will follow in Elmwood Cemetery. Parking for those attending the church service will be available on 9th Street in the Odell Building underground garage. The family will receive friends at 827 Berkeley Avenue during the hours of 7:00 until 9:00 PM Wednesday, June 14, 2000. Memorials may be made to First United Methodist Church, 501 North Tryon Street, Charlotte, NC 28202-2231. Harry and Bryant Company is serving her family.